Potters, if you're childless, near 100, and someone tells you you'll have a son this time next year, YOU'D PROBABLY LAUGH, TOO! ...Then they laughed because they were over come with the blessing of God's promises! 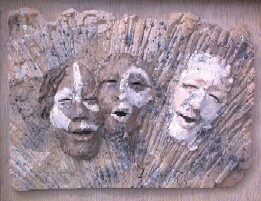 Multiple colors of clay formed into a 3/4"-1/2" slab, pressed with the edges of sticks, self-portrait life-mask-mold used to pull 3 faces that were radically altered, sprinkled with frits and colorants, painted with slip, cone 10 reduction. .. really a 'pot like form', purely for holding space, not beans or rice! 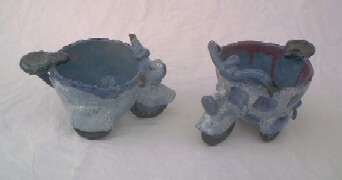 I made this as a 'demo' for student potters just learning the coil method. ..how they could control the shape of the pot, and how high they could go. I may decide to sand blast some of the glaze off sometime to better show the individual coils. These guys, Scooter Cups, each about 6" x 7", are for eating ice cream at celebrations! When kids, young or old, see that you can take a simple pinch pot and make just about 'anything' out of it, THE LIGHT TURNS ON! ...Of course, the real reason was that I was more interested in fighting boredom than making a buck off a 100 same or similar cups. Well, I think that's enough, eh? I can always change 'em around when I get bored of looking at 'em.